The green aircraft flew relatively low in the sky, the roar of its engines, the only mechanized sound heard. The craft tore through the thick atmosphere of the now dead planet. No ordinary vehicle, this one was composed of pure will. The will of it’s pilot intent on understanding an enemy before a confrontation. 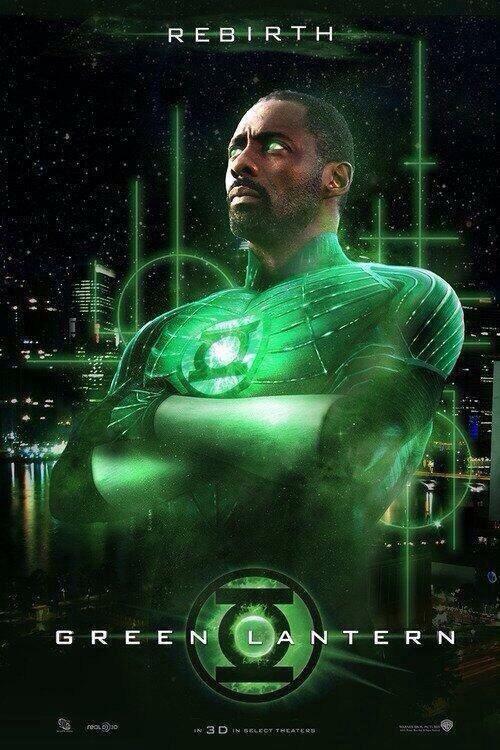 “Excuse me Green Lantern? Er, do you have a name?” The Dirne citizen looked pretty indistinguishable from any other member of their species. Bilaterally symmetrical, they appeared cosmetically similar to humans but their physical structure showed generations of genetic manipulation. Their super-sensitive skin was rust colored, with tiny variations too tiny even for the human eye to recognize, but the Dirne claimed they had over five thousand color shade distinctions. Dirne faces were smooth with only eye indentation and no external ears, their slightly larger heads housed a powerful multi-lobed brain. Descending from an aquatic environment, their entire body was a sensory organ whose collective light absorbing capacity was ten thousand times human acuity. A patch of their skin the size of a dime, could perceive as effectively as a human eye with 20/20 vision and hear as well as a cat, well within the 40,000 Hertz range. Recorded data storage showed the Dirne wore loose-fitting diaphanous robes, which gave them the ability to perceive each other fully and interpret their changing radiation signatures, another more subtle and yet advanced communication. By vibrating membranes near what humans would call their vocal cords, the Dirne could communicate using sound. Much slower than human speech, their vibrations were rich in nuance, each tone having a specific meaning. To human ears they sounded much like crickets. From inside their environmental suits, they must have been feeling as blind as bats. Faran stared intently and then motioned to her fellows who leaned over from their seats. Stewart altered the information display into a three dimensional structure capable of being seen by everyone. At first silence and then as if an insect swarm had invaded the tiny ship, untranslated chittering commenced. “How much do you know about your omni-device?” Faran asked. Inflation energy, I remembered being taught the Universe was once smaller than an atom and when it engaged in the Big Bang, it expanded faster than the speed of light. This energy was called “inflation” and as the universe expanded, this was the energy of that expansion. As far as we knew, inflation was still happening, moving everything in the universe farther apart. This energy would be nigh infinite and inexhaustible. It could also be potentially unstable if not properly understood. A mistake would make an antimatter accident look like Pop Rocks. Wow. A better explanation than the Guardians ever gave. Complete with graphics. It did. But its amplitude was far greater than anything on the first curve. It was at least one hundred times more powerful. “This can’t be right. Nothing doing this could possibly exist. Ring, confirm hypothesis.” The ring was silent as it ran its analysis and in less than a minute, it’s reply was exactly what I didn’t want to hear. A timer indicated a two minute countdown to arrival at the predefined coordinates. 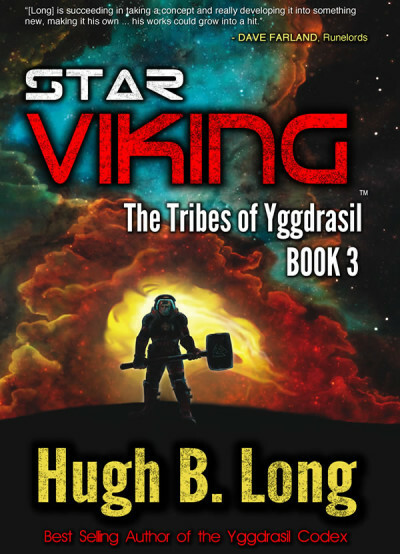 As the six of them approached the underground facility, they could see spears of smoke forming around the base, forming into more substantial shapes. Humanoids made of grey smoke. They approached the entry points on the above ground station. Doors refused to open preventing the smoke forms access. The smoke tore at the doors and in a few seconds reshaped themselves until they could pry the doors apart. Sparks flew and the contest between the smoke entities and the security doors was never in doubt. I can’t believe I am about to take a page from Guy’s book. On the other hand, a stopped clock can be right twice a day. With his ring flaring and bleeding wild energy, John Stewart severed the bonds of local matter beneath the creature and inserted antiparticles in their place. The resultant antimatter explosion could be seen from space and liberated a percentage of the atmosphere in the blast; an environmental catastrophe John hoped to repair. If he survived. The Farad alb Dine and her fellow scientists stopped working; they were at some considerable distance and protected by John’s ship construct, in momentary horror as the light from the explosion ended. Knowing it would not be enough, they worked feverishly as the wisps of the smoke-like alien began to reform in the tortured ruins. The smoke-like entity was all around me. It obscured the stars in a way nothing ever had. I had used my power ring to look through nebulas using neutrinos for a light source. Whatever this was had less substance than that. Yet, I could not see through it using any technology I knew of. A few seconds later, it vanished. A broad spectrum sweep revealed nothing. No energy, no matter, no signature that it had ever been there. The stars returned and the subspace corridor entry points reappeared to my enhanced senses. There was nothing but a floating graveyard to ever prove anything was there. And the echo of its pronouncement. How convenient. No signals until after the monster left. A trap. Okay, I’d come this far and still didn’t have any answers. I’d play along. “Erect hazardous material biofilters for all known contagions. Unless otherwise noted assume no planetary materials should come in contact with me. Maintain shield posture.” Shaping my ring aura, I tailored it for maximum efficiency as I sliced through the atmosphere. The temporary heat bloom passed as I appeared over one of the main megacities. A twenty minute flight into the atmosphere of the Dirne IV did not make me feel any better. I could see the scars of aircraft that tore into the surface of the planet as they fell from the air. Some of the ruins were still smoking. Beyond that, much of the planet’s automated power was still active. The machines of this world lived even if the people didn’t. There was something that bothered me but I couldn’t put my finger on it. Atmospheric scans didn’t reveal anything out of the ordinary. No pathogens as compared with previous atmospheric surveys. Previous scans of the people of Dirne IV would have had no problems from this current atmosphere. Then I realized what was strange. I wanted to have a sample of the current citizens and I realized there were no bodies. Not a single one in this city. A circular scan revealed not a single person on the surface of the planet. Broadening the sweep a second scan below the surface revealed isolated pockets of biomatter but only in places with dense materials around them. The closest was from the city right below me. The biosignatures were from seven kilometers below ground. Even though the atmosphere scans said they were clear, I didn’t want to expose these survivors to whatever killed everyone else on the planet. “Ring, I want fifteen constructs to find the closest, fastest route to the survivors. I don’t want to have to break any walls, or disrupt any infrastructure that might be protecting them. Get me as close as you can.” The ring responded flaring brightly and shooting fifteen small fireworks out that streaked across the surface attempting to penetrate the ground before disappearing from sight. Looking into the ring, I could see the three dimensional paths each beam took as it moved into the undercity. Only three beams were able to reach reasonably close to the survivors, the others winked out of existence as they failed to get closer. Scans revealed they were part of a geothermal power team in a hardened underground facility. Sealed during operations and within biosuits to deal with the increased temperatures and pressures, they were twice protected. I could barely scan for them. Which meant whatever killed Dirne IV may not have known they were there. I ceased my scans. But not in time. I saw the trailers of the smoke rising from the ground, the same light absorbing vapor I detected in space. Then the ground beneath my feet began to rumble as a massive earthquake tore through the area. So much for being subtle. Whatever the hell this stuff was, it wanted everyone on this planet dead. Launching myself into the air, I envisioned a reinforced tunnel straight to the powerplant. Something that grew stronger as pressure increased on it; something Buckminster Fuller could appreciate. The chamber formed below me, I used the power of the earthquake to my advantage since it was destabilizing the planet, I didn’t have to tunnel so much as simply wedge it open and keep it that way. I saw the structure necessary and built it, reinforcing it as needed. A second tendril small and fast maintained a lock on the technicians. They were running to a transport system hoping to outrun the quake. Not gonna happen, gents. Somebody wants you dead. We raced through the crust of the planet. It was all around me, but it didn’t attack. It’s focus was solely on the Dirne below us. I couldn’t keep using its disruptions. I was already pushing my power, six kilometers into the surface of the planet, the pressures were immense. But whatever I was racing had not let up it’s assault. My ring detected quake forces at eight point five and climbing. The engineering of the Dirne must have been fantastic, because the site was still holding up. But no matter how good they were at building, most materials began to tear themselves apart at forces above nine point five. I was going to have to take the lead. My ring was already pushed to the limit and I felt the feedback common to reaching one’s limits. Pinpoints of sweat formed on my forehead. Fighting with constructs in space is easy. Nothing to get in the way. Tunneling through planets at kilometers below the surface was a completely different experience. You had to keep track of the matter, the forces, the shearing stresses and create a means to compensate for them. I knew this math intuitively being an architect, my ring translated my knowledge into reality as I add a second beam to the tunnel, blasting through the crust with a drill construct, grinding up the matter and using it as a power source to push faster than the planet disrupting shockwaves of the Entity. I was slowly moving ahead of it. I was six seconds, seven seconds, eight seconds ahead. The power plant was underneath me. My power broke through the ceiling of the plant and I targeted the Dirne below. My drill became a spring loaded grapple shooting out to grab five of the six. One of them had already managed to make it the underground tram and was about to leave his fellows behind. Couldn’t reach him in time and save the others. Made my choice. As I pulled the others back toward my tunnel, I could feel the creature arrive on the scene and black smoke speared toward the tram. It tore through the metal and grabbed the Dirne. It swirled around him as if seeking weaknesses. I pulled the other survivors up the corridor allowing it to collapse behind them. I left only the tiniest bit of my green power behind to observe the Entity. The rest of my will was focused on maintaining the environmental conditions necessary to keep the Dirne from being overcome by the rapid change in pressure. I surrounded them in a bubble which acted as a decompression chamber. I depended on the ring to provide the metrics to keep them alive while I focused on collapsing the tunnel. With the fragment of my consciousness remaining, I viewed the last Dirne as the smoke penetrated his suit and stripped the flesh from its internal skeleton. Seconds later, it consumed the skeleton and the suit behind it to escape. Then the form coalesced from around the room and then speared toward my sensor and the path created by my will. I didn’t intend to be here when it reached the surface. Pulling the environmental bubble behind me, I put some distance between the surface and the Entity. I could feel the life energies of the survivors through the ring’s feedback. They had questions, but I didn’t have time to answer them. I reshaped their life support field into a superfast aircraft. Hal might be able to do this faster, but right now I was motivated and I kept several designs in my ring for just this occasion. Seated in the center of the ship construct, I punched it and headed toward the distress signal on the next continent at twelve times the speed of sound. Only inertial dampening kept us from being crushed like bugs on a windshield. Instead, it felt like a boot from a giant. The city vanished below the horizon in ten minutes. I altered course since I wasn’t sure whether the Entity had any idea of where I was going next. I kept my signature low and reduced my power output until I could shield us completely and reduced our output signature. We became a ghost in the air, using no more ring energy than necessary. Once the Dirne were properly pressurized, I ditched the environmental bubble, but told them to keep their suits on. I replenished their air supplies and had the ring repair any damage to their suits. To keep our energy output low, I landed in the snow and created a sled big enough to carry us and the accompanying dogs necessary to drag us where we wanted to go. We moved fast and below the radar. I didn’t reduce speed until we were near the facility. Unlike the megacity, this appeared to be a tiny outpost at the polar cap, a nasty environment, too. Below zero temperatures, strong winds, and blinding snow. I didn’t think we would be able to see anything until we got close to the site. We were wrong. Fires raged across the landscape and glowed brightly through the falling snow. A black smoke speared scattering Dirne-shapes in the light of these fires. Pinned to the ground, their screams were cut short as they were turned into piles of black ash. We were too late. The smoke coalesced and shot off into the distance. Toward another location I detected earlier. It used me. I hated to be used. Being a Green Lantern meant we liked to take the high road, remain civilized, and resolve difficulties between species in a civil fashion. I was so past that. I waited for the ring to translate. Some ideas didn’t translate well and you ended up getting responses from amusement to outright confusion. Standing around in the burning facility with piles of ash where Dirne used to be, must have added the right context. I made the fastest ship I could think of. My name is John Stewart. I am Green Lantern of sector 2814. Wait, let me rephrase that. I am one of four Green Lanterns for this sector. 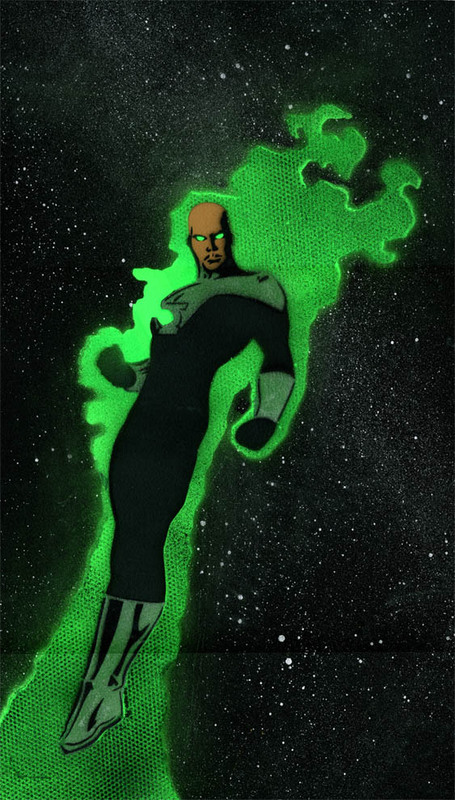 The best known is Hal Jordan, the most obnoxious is Guy Gardner, the most powerful is Kyle Rayner. I am the other Lantern. Rarely talked about except in certain circles. But I don’t mind. Earth isn’t the only game in town, anymore. Out here, where the stars grow far apart and civilization is hard to find, everyone likes to know there is a bit of order in a chaotic universe. People call us space cops, but we are more than just cops. We are the Peace Corps helping people improve their chances at civilization in an increasingly hostile universe. We are the Red Cross bringing aid to planets in need, repairing damage caused by natural phenomena. While we don’t provide financial aid, the rings allow us to help with rebuilding efforts, for the few Lanterns with any architectural talent. When the times demand it, we are the Marines; first on the beach bringing the pain to invaders who would trade in sentient life, steal necessary resources or even entire planets. I’m not complaining either. To paraphrase the only credible line from Sergeant Apone in Aliens: A day in the Green Lantern Corps is like a day on the farm. Every meal’s a banquet! Every paycheck a fortune! Every formation a parade! I LOVE the Corps! If we only actually got paid. The Guardians think the privilege of being a member of the greatest law enforcement agency in the galaxy is reward enough. And damn their little bald blue heads, they’re right. I wouldn’t trade this job for a barrel of gold monkeys. Maybe for two barrels. Okay, three barrels, for sure. I once thought I was the most likely of the four to stay on Earth. After the Color Wars, I realized I didn’t have much left holding me there. Being a bit of a workaholic, I directed my energies into the only thing I had left. I know what you’re thinking. I could have given up the ring. It’s not like there weren’t already enough GLs out there to do the job. Seventy two hundred Green Lanterns and a smattering of others Color Corps out there doing whatever their rings and their disposition allowed. Space is big. Plenty of room out here. Too much space to be flying around and hoping you are going to run across anything by accident. Star Trek spoiled the hell out of me. Had me thinking I would just run across something every week. Not a chance. Space is like an ocean without a border. You don’t run into anything out here by accident. I collapsed the four dimensional construct I had been sitting inside of floating above Oa. After what we’d been through recently, I needed to be close to Oa, but not too close. I was about ready to take my show on the road again. Policing the spaceways required technology, time and patience. I spent the last week in meditation on my planetary buoys in the inhabited star systems in 2814. I created this system, allowing me to monitor activities across my entire sector without having to spend too much time wandering around. These were more useful when I was spending more time on Earth, but there’s no reason they can’t be as useful now. 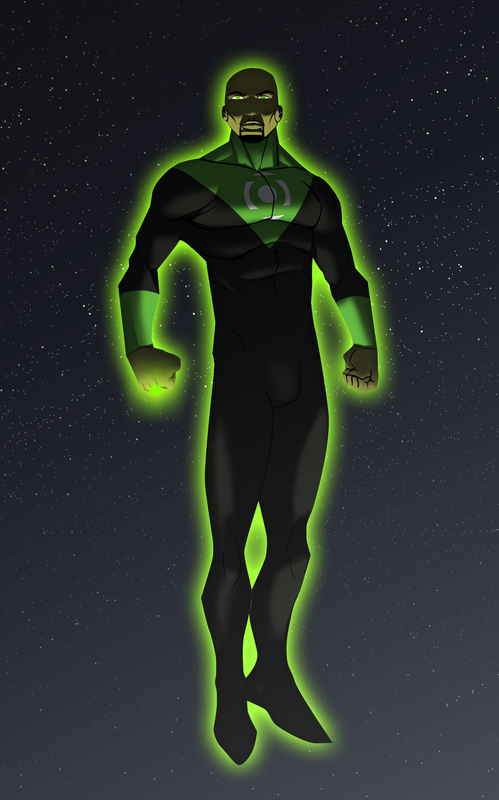 I designed the first one while I was on Oa with Salaak, back when I first became a Lantern. Back in those days, the Guardians monitored space using their big blue brains and just told us where to go. Didn’t seem very efficient to me. I also wondered what would happen if the Guardians were to go on vacation, or got an attitude, or decided to spend a week in the bathroom. Space is so big, it simply didn’t make sense to me how we could cover such a wide area, even with the capacities of the ring, it took time and effort to reach distant locations at the edge of your sector. Seeding these self-replicating drones across the sector, each could monitor inhabited worlds and report back to Oa using entangled communications, instantaneous, no matter how far apart they were. It took years to seed the planets but I thought it was worth the effort. While the Guardians won’t admit to it, I figured out my designs were becoming standard issue in the new Corps. The signal relay technologies were invisible to most planetary star systems and those with the capacity to find them were asked if they wanted the support of the Corps. If they said no, we didn’t seed their worlds and would respond to requests, as fast as we were able, once we learned of their dilemma. It could take weeks, or months. If you lived on the fringe of our sector system, it might take up to two years using our fastest technology. Today, it appeared one of those worlds wanted to chat. Half a dozen years ago, Dirne IV had originally refused our request to seed their planet. Three years later, something changed, perhaps local politics and a request for a signal relay was made and granted. I used to fly by when time permitted and their worlds always seemed peaceful and prosperous. I received the message from one of the new Guardians who politely requested I head to Dirne IV and investigate a planet whose technology would have made them a galactic power, if they weren’t so isolationist. The case seemed different than the standard ‘protect my planet from this incursion, Green Lantern‘ mission so common to our duty roster. These were the missions I enjoyed the most. I love ring-slinging as much as the next Lantern. I think I was made for more than that, though. Diplomatic missions, science, and investigation ranked higher on my list than our standard, ring ‘construct: mace’ bash alien head. Can’t head out without a full charge. Never knew who you might meet. Reaching into my subspace pocket, I pulled out my Lantern. I could mooch from the prime battery on Oa but I was just not feeling all that social today. Everyone was still raw from the Darkest Night. Getting off of Oa was just what I needed. Putting my lantern back, I located a hyperspace corridor heading to Dirne IV. There were several in that area, the star system of the Dirne ran through a cluster of populated worlds several light years apart. The hyperspace corridor I used criss-crossed my sector at various points and was faster than making my own wormholes. Used less energy too. Dropping out of the hyperspace lane and what I saw was wreckage; tens of thousands of ships. I also couldn’t orient myself visually. The star Dirne Prime was not visible, but its gravitational tug was evident. In fact, no stars were easily visible, as if I was seeing them through a smoke or particulate matter. The hyperspace corridor was a construct designed to let ships enter Dirne space at this location. Judging from the debris, the Dirne had blockaded this point. I recognized the Dirnese ships from the Oan database. It’s what I didn’t see that worried me more. There were ships everywhere, but none of them belonged to the enemy. Whoever did this didn’t lose a ship. I stole a bit of scanning bandwidth back from the ring and listened on what would be local com traffic. Nothing but silence. I swept the entire spectrum and the only thing I found were data-drive satellites attempting to share their collected with the ground computers. Nothing on the ground moved either. The planet, Dirne IV was silent as the grave. Then I had a terrible realization. What if this is an internal affair? Maybe there were no alien ships because this was a civil dispute. “What was the last population survey of the planet Dirne IV?” I dreaded the answer. Being able to make this many ships indicated a fantastic infrastructure in this local star system alone. “They were last surveyed by the Guardians, three hundred cycles ago. The planet below was host to 15 billion sentients. Relatively underpopulated, most of the people living there were engaged in scientific preservation of what is believed to be their planet of origin.” The Dirne had spread throughout this entire star system, taking over the four inner rocky planets and two dozen moons and asteroid bases. The total species population was 438 billion, calculated to a three decimal place margin of error. There was a reason I didn’t see Dirne Prime. Whatever this object was, it was big, bigger than a planet.